Last year, I threw my daughter a birthday party large enough to rival most weddings. It was fun, I made a ton of “retro cherry” themed desserts, and everyone was impressed — but I was exhausted. I didn’t get to talk to many of my family or friends, and I felt like I couldn’t really focus on my daughter. 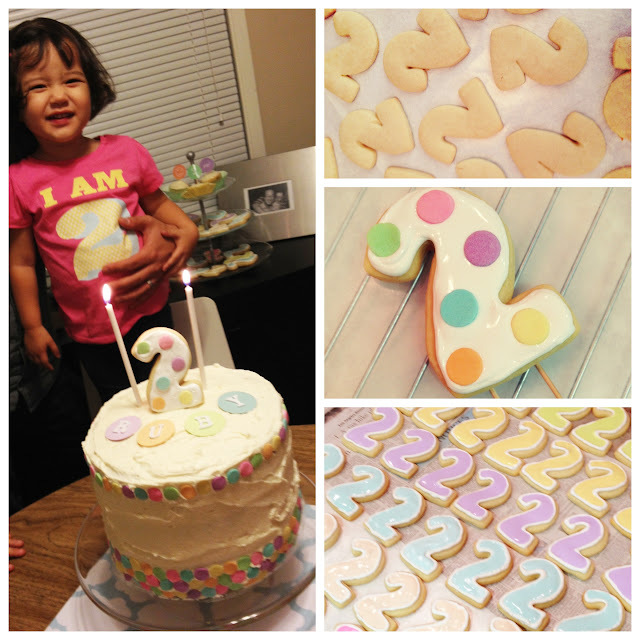 So this year, I resolved to scale back, simplify and throw a small party with the family to celebrate her turning two years old. I did succeed in reducing the size of the party, but of course, I couldn’t resist making a giant birthday cake and some special “2” shaped cookies, even though it was just going to be a “simple” party. It all started when I found a 2-shaped cookie cutter online. I knew I wanted to make a 2 for the top of her cake, and I decided while I was at it, I’d ask my dad to teach me how to decorate with royal icing. My parents made 150 bride and 150 groom sugar cookies for my wedding favors, so it’s safe to say they’ve got experience under their belts. I enjoyed working with them both on these! 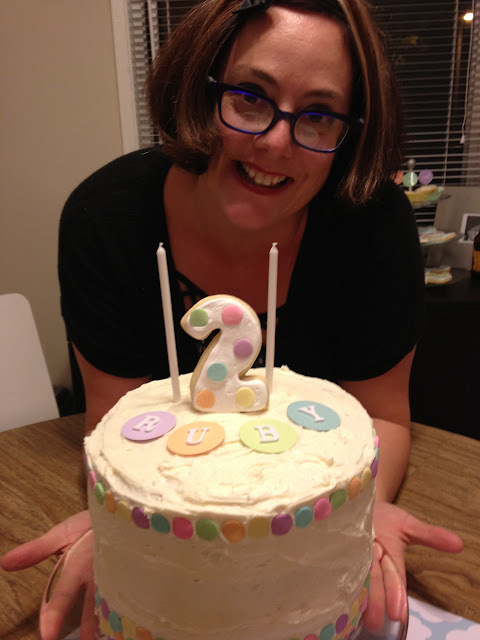 What I was most excited about was making my 1st birthday cake. I found this amazing recipe for Marshmallow Buttercream Frosting, and I decided to pair it with lemon cake. Let me tell you this: I’ll never use another frosting recipe in my life. It was fluffy, light and tasted amazing. I really wanted the cake to have a homemade feel to it, so I iced it somewhat messily and used jumbo-sized confetti sprinkles to decorate with. 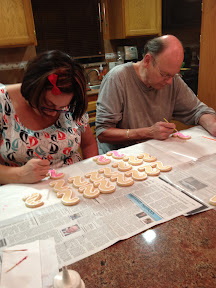 My dad had a great idea to use the royal icing as “glue” to attach two toothpicks on the back of the cookie I wanted to use as the cake topper. I used my 1-in. craft punch to cut circles out of scrapbook paper for the top, and I used some jumbo letter stickers to spell out my daughters name. It was sweet, tasty and made my little girl smile, so I consider it a huge success! 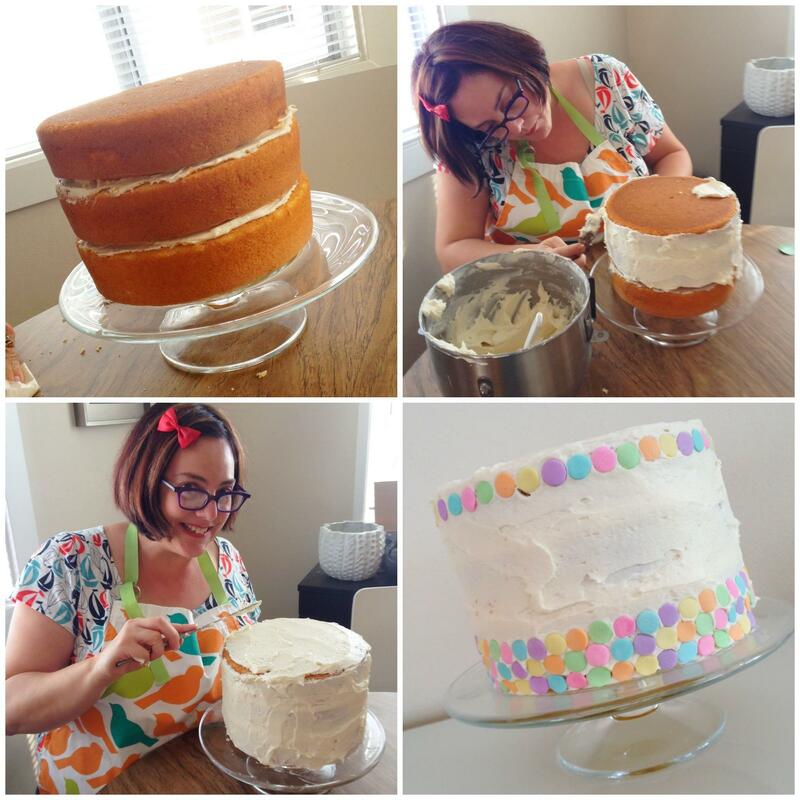 This entry was posted in Party and tagged baking, cakes, cookies, decorating, favors by Carrie Kim. Bookmark the permalink. I am so glad that you like the frosting so much! I love that one too. Sometimes I add lemon to it or a little jam to make a berry flavor.